Outdoor lighting products are an essential tool for any shindig you are going to be hosting and the sheer variety of options available can be a little overwhelming at times. Solar lights have previously had somewhat of a bad rap when it comes to choosing your back yard illuminations, but in recent years they have come on leaps and bounds with great advances in the technology. Solar lights have always had a reputation for being a little powder puff. The luminescence achieved was always questionable and relying on them to sufficiently light your get-togethers was not really an option. Present day offerings however have improved immeasurably and now provide significantly better sources of light than what was previously achievable. Whilst it may be a little foolhardy to suggest that you can expect light levels comparable to football field floodlights, outdoor solar lights have the potential for providing more than enough light for your small parties. Along with natural moonlight and interior lighting (if needs be), solar lights can provide a beautiful, ambient glow for you and your guests to enjoy. Depending on the type of solar light you choose they can also highlight some of your best landscaping features. 1 Why Choose Solar Lights? 2 How do Outdoor Solar Lights Work? 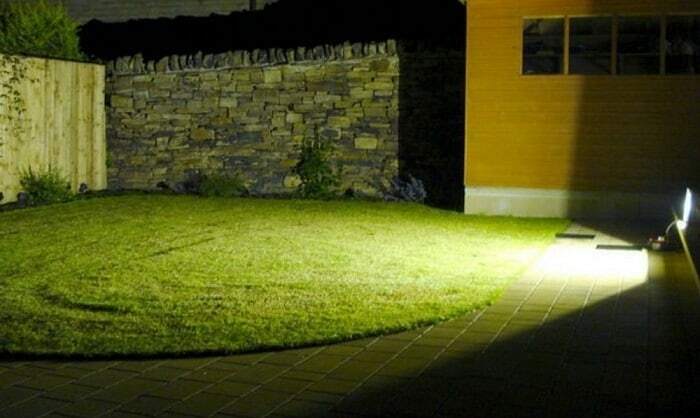 Solar outdoor lighting is the easiest and cheapest way to brighten up your nighttime shindigs. Traditional lighting will require some level of competence and electrical know how when it comes to rigging your setup. It’s definitely not the hardest thing in the world to do but double checking the whole system is imperative unless you want to experience a cacophony of blown bulbs. With solar lighting though there are none of these worries. They are pretty much good to go straight from the box and the only decision to make is where to place them. They also represent excellent value for money as there is no added expense by way of electricity bills. In fact, it is said that the solar led lights will last for 100,000 hours. There are also issues of safety that solar lights benefit from. There are no wires needed to power them which negate the chances of fires occurring due to electrical faults. If you have curious children or pets, this also means that there will be no exposed wires which could lead to nasty shocks if happened upon. How do Outdoor Solar Lights Work? Solar lights generally consist of a solar cell, a rechargeable battery, LED lights and a photoresistor. On sunny days (or even cloudy days with some of the better solar lights) the solar cells will take in light and produce energy which is stored in the battery. When the daytime turns to night the photoresistor will sense it and activate the LED lights. It is a remarkably efficient system which maximizes the natural resources available to produce clean light. There are a variety of different types of solar light you can use to accentuate the best features in your back yard or to throw additional/ambient lighting onto the entertaining area. There are lights that can be used to light pathways, lights that can be hung from your guttering and lights that will decorate your trees and shrubbery. Knowing which light serves which purpose is essential to maximizing your potential ambiance. Solar Spot Lights – Probably the most popular form of outdoor solar lighting. Solar spot lights can be staked into the ground or mounted on walls or other fixtures which makes them a very versatile piece of equipment. Solar spotlights are some of the brightest solar lights that you can buy and can be used to highlight individual features in your backyard such as water fountains or fruit trees but can also be called upon to provide ample light for your outdoor entertaining needs. One of the solar spot lights best features is that they can be adjusted so that the focus of the light that is generated can be pointed into almost any direction you desire. Almost all spotlights will have 180-degree functionality with the higher priced items offering complete maneuverability. URPOWER sell the number one best-selling solar spot lights on Amazon that generate 200 lumens of light through its 4 LEDs. You will get 6 – 9 hours of light from these solar spot lights which will safely see you through the summer nights but just in case there are 2 modes which let you change between high and low power output. Magictec also sell some good solar spotlights as can be seen with their warm white landscape solar lights. It also has the 2 power modes evidenced in the URPOWER lights but due to the nature of warm white light can offer 10 hours of light on a full charge. Solar Flood Lights – These are the solar lights that will scatter the brightest light over the largest areas. 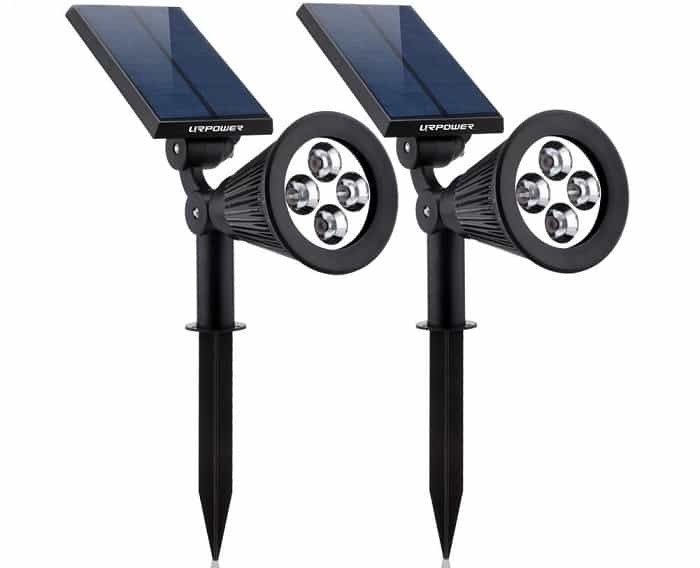 You will sometime see these confused with solar security lights but whereas they are distinguished by their motion sensor properties, solar flood lights will provide continuous lighting for up to 10 hours. Magictec offer this multifunctional solar flood light which puts out 600 lumens worth of light. As a comparison, in our outdoor projector article, we showcased a projector that offered 800 lumens of light. This particular solar flood light can be used in strong lighting mode or in motion sensor mode should you like to double up on its usefulness. Coming to a total of 1100 lumens, Bizlander offer this commercial grade solar floodlight which offers dusk till dawn capabilities. It has 108 LEDs and comes with a 16ft cord which means it can be mounted almost anywhere. This particular floodlight also comes with a manual override switch which can switch off the automated response of the lights sensors. Solar String Lights – These are some of the most versatile lights available. They can be used as a beautiful decorative piece to scatter around tree branches or large plants. 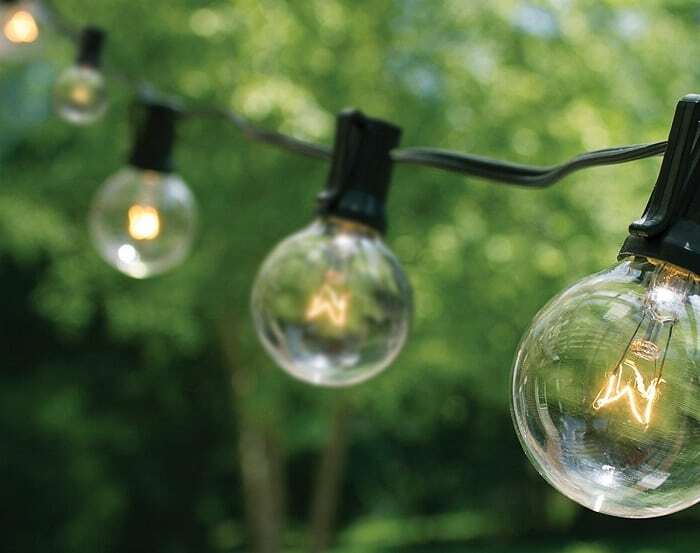 Equally, and more importantly for your shindig needs, they can be hung around your porch, patio or in between trees to provide a source of overhead light. A good example of solar string lights are these from Fulton Illuminations. There’s 25ft of lights included with 25 bulbs and a few handy spares. They produce a white light that will shine a bit brighter than the warm white bulbs that you can get. That’s not to say the warm white solar light bulbs are no good. They are perfect ambient sources of light. If you just want some soft, mellow lighting going on then these are probably the lights to go for. CMYK sell these solar string lights which gives you 20ft of lights that include 30 bulbs. Solar Rope Lights – These are lights that will be used solely in a decorative fashion. I tend to think of rope lights in the same way I do fairy lights, only a lot sturdier. Solar rope lights are probably most suited to being wrapped around things such as porch banisters, small tree trunks and garden furniture and benefit from being fully waterproof unlike some of the more dainty fairy lights. 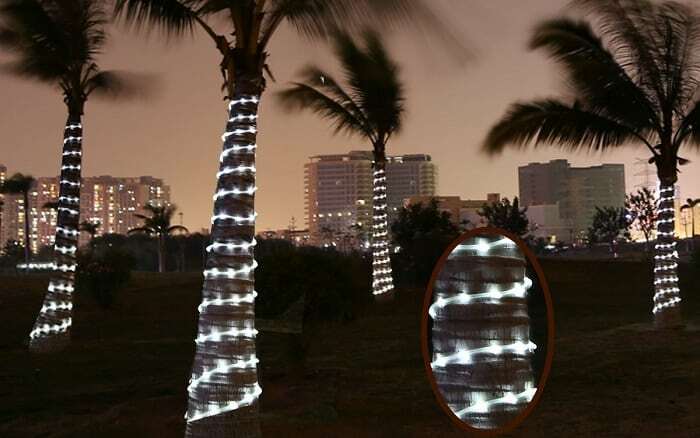 Lighting EVER make these white light solar rope lights that measure just under 23ft. There are 50 LED lights in the rope and it comes with 2 modes – full brightness or flash mode, so you can tailor suit it to your needs. An alternative suggestion comes by way of these solar powered rope lights by Ankway which measure a stomping 72ft. Such length is ideal for wrapping larger features that you may have in your backyard such as fencing or large trees. It comes with a large 4in solar panel which allows better intake of solar energy. Solar Lamp Posts – Solar lamp posts like this one from Paradise are the ultimate in outdoor solar lighting aesthetics. Made to resemble old school lamp posts, these solar lights aren’t the brightest on the market but certainly do a fantastic job of bringing a touch of style to your backyard. 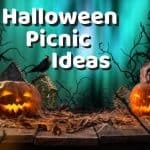 Solar Lanterns – Solar lanterns can be scattered here, there and everywhere making them a beautiful addition to your garden landscape. Solar lanterns like this from Smart Solar can be used placed on the ground to highlight some of your plants whilst giving an elegant, classy feel to proceedings. They are probably best utilized when you can hang them however. There are many hanging solar lanterns that you can buy which have the standard, traditional look but I really like these Mason jar inserts that you can get from iThird which bring something a little different to the party. Solar Step Lights – These are used mainly for safety reasons to prevent you stumbling around in the dark on hidden steps but it does not mean that they can’t look quite stunning. 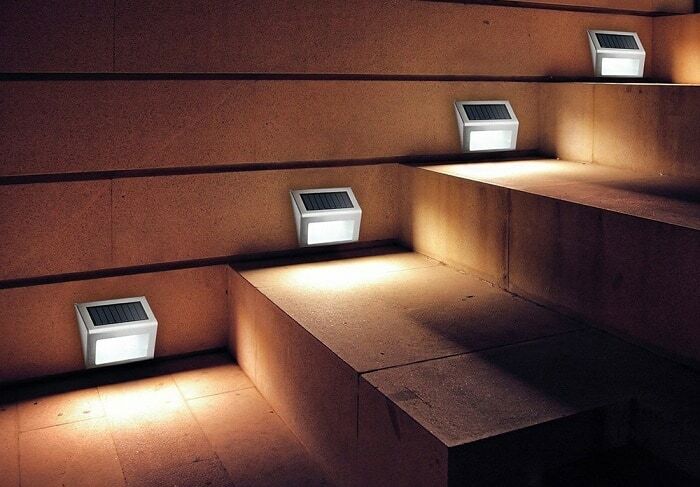 iThird make another appearance in this article with their set of 4 solar step lights which put out 24 lumens and can produce light for up to 12 hours from a full charge.